Darra Goldstein, editor. 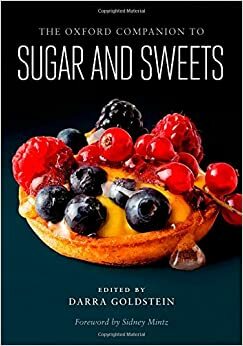 The Oxford Companion to Sugar and Sweets. Oxford University Press, 2015. Full disclosure: I have two entries in this book, one with Daniel Bowman Simon. Simon DB, Nestle M. Soda lobbies. In: Goldstein D. The Oxford Companion to Sugar and Sweets. Oxford University Press, 2015:681-682. Nestle M. Soda. In: Goldstein D. The Oxford Companion to Sugar and Sweets. Oxford University Press, 2015:623-624. With that out of the way, I can only think that the editors of this book, Darra Goldstein and Michael Krondl, must have had the best time pulling this together. The encyclopedia starts with an elegant introduction by Sidney Mintz, author of Sweetness and Power, the one book that tops everyone’s list of must reads in food studies. The remaining 800 pages or so are devoted to entries by 265 authors on matters as diverse or arcane as dulce de leche, nanbangashi (“southern barbarian sweets”), syllabub, and whoopie pie (look them up). I especially like the Appendixes: lists of films featuring sugar and chocolate, songs about sugar and candy (often as a metaphor), and museums. The illustrations are lavish, especially the two sets of gorgeous color inserts. Subtlety: The Marvelous Sugar Baby, alas, is gone from the Domino Sugar Factory in Brooklyn, but it lives on here. For that alone…. I’ve been collecting items on sugars. Here are the first two. Two more will come later this week. 1. The American Academy of Pediatrics Council on Nutrition has new guidance on sugars in schools. A positive emphasis on nutritional value, variety,appropriate portion, and encouragement for a steady improvement in quality will be a more effective approach for improving nutrition and health than simply advocating for the elimination of added sugars. I ask because Kellogg could not be happier with this approach. A little sugar, it says, may help kids eat more nutritious foods. Surely it’s not a coincidence that one of the authors discloses receiving support from the National Dairy Council and the American Dairy Association, and the other receives support from the Nestle Nutrition Institute. In any case, we aren’t talking about a little sugar in schools. We are talking about candy, cupcakes, and drinks brought in for birthdays, treats, and after school celebrations. This, you will of course recall, is the controversial multinational trade agreement currently under negotiation (see my previous post on this topic). Japan wants to keep its tariff on sugar. It now appears that the Japanese sugar industry gave a 1 million yen donation to a political group that supports Minister of Agriculture Koya Nishikawa, just before he became involved in the TPP talks in 2013.
his receipt of a donation from an industry group brings his morals as a politician into question. Nishikawa stated that he returned the donation in light of his capacity as agricultural minister, but this is unlikely to resolve the situation…In March 2013, it was announced that the Japan Sugar Refiners’ Association would receive 1.3 billion yen in subsidies under a Ministry of Agriculture, Forestry and Fisheries’ project. At the very least, this situation looks like blatant conflict of interest. The World Health Organization (WHO) has finally officially released its recommendations for sugar intake. I say “officially,” because I posted an earlier version these guidelines late in January. For general health, Reduce daily intake of free sugars to less than 10% of total energy intake. For additional health benefits: Reduce daily intake to below 5% or roughly 25 grams (6 teaspoons) per day. This recommendation is based on a scientific review as well as comments by groups such as Center for Science in the Public Interest. The British advocacy group, Action on Sugar, is disappointed in the recommendations, thinks they don’t go far enough, and suspects that heavy food industry lobbying was at work. There is absolutely NO nutritional requirement for free sugars in our diets, therefore AoS is disappointed that the 5% recommendation is conditional. The WHO used the GRADE[Grading of Recommendations Assessment, Development and Evaluation] system for evaluating the evidence which is useful for drug trials, but is not appropriate for the links between diet and health. This has allowed the food industry to sow the seeds of doubt amongst the WHO, who have failed to come up with the strong recommendation that is so vitally needed, especially for children. On the other hand, the food industry says the recommendations are misleading and based on weak evidence. The US Sugar Association [said]…Such a claim is serious, and requires high-quality data, particularly given the potential for consumer confusion and the likelihood that the economic impact to developing countries will be severe. There was a need for extensive debate, especially before the 5% value was included in official recommendations, said the European Committee of Sugar Manufacturers (CEFS). “Especially because the data this value is based on was deemed to be of very low quality by both WHO and the dental health review authors,” it said…. The sugar industry said that sugar in isolation could not be blamed for obesity and asked people to focus on what the WHO defined as the primary cause of obesity: an imbalance between calories and activity. The WHO recommendations are similar to those issued for decades by national health agencies. The last time WHO tried to issue the 10% of calories advice in 2003, it got clobbered by lobbyists. This time, lobbyists didn’t succeed. This is progress. Tomorrow: more on sugar lobbying. BMJ (formerly the British Medical Journal) has just released an editorial and four papers on ties between the sugar industry and public health scientists who advise the government on health policy. Some health policies involve recommendations about intake of sugars. Recipients of research funding from sugar and other related industries include members of the Scientific Advisory Committee on Nutrition (SACN), which is currently updating official advice on carbohydrates consumption, and researchers working for the Medical Research Council’s Human Nutrition Research unit (HNR). HNR scientists have received research funding and funding in kinds from companies including Coca-Cola, Mars, Nestlé, Sainsbury’s, the Institute of Brewing and Distilling, Weight Watchers International and others…Of the 40 scientists affiliated with SACN between 2001 and 2012, only 13 have had no interests to declare. This, of course, is no different than what we see here. Food and beverage companies support food and nutrition research as well as professional societies, and conflicts of interest are rampant. Even so, these well documented studies are alarming and worth serious attention. And be sure to look at the map. Sugar’s web of influence 4: Mars and company: sweet heroes or villains? MedPage has a nice summary (I’m quoted). WHO versus noncommunicable (chronic) disease: where’s the sugar target? The World Health Organization (WHO) released two reports within the last week aimed at preventing noncommunicable diseases. Although the second is all about reducing sugar intake, the first report is about everything but. more action to be taken to curb the epidemic, particularly in low- and middle-income countries, where deaths due to NCDs are overtaking those from infectious diseases. Almost three quarters of all NCD deaths (28 million), and 82% of the 16 million premature deaths, occur in low- and middle-income countries. Target 1: A 25% relative reduction in risk of premature mortality from CVDs, cancer, diabetes, chronic respiratory diseases. Target 2: At least 10% relative reduction in the harmful use of alcohol, as appropriate, within the national context. Target 3: A 10% relative reduction in prevalence of insufficient physical activity. Target 4: A 30% relative reduction in mean population intake of salt/sodium. Target 5: A 30% relative reduction in prevalence of current tobacco use in persons aged 15+ years. Target 6: A 25% relative reduction in the prevalence of raised blood pressure or contain the prevalence of raised blood pressure, according to national circumstances. Target 7: Halt the rise in diabetes and obesity. Target 8: At least 50% of eligible people receive drug therapy and counselling (including glycaemic control) to prevent heart attacks and strokes. Target 9: An 80% availability of the affordable basic technologies and essential medicines, including generics, required to treat major NCDs in both public and private facilities. Don’t dietary sugars have something to do with diabetes and obesity? How come no specific target? This is especially odd in light of the second report. A reduced intake of free sugars throughout the lifecourse (strong recommendation). Reducing the intake of free sugars to less than 10% of total energy intake (strong recommendation). Why no target for sugar reduction to 10% of energy in the first report? The omission is glaring. Could politics be involved? It’s hard to think of any other explanation. WHO needs to speak with one voice on NCD targets, guidelines, and recommendations. **Thanks to Dr. Karen Sokal-Gutierrez for alerting me to the lack of a sugar target.